In the early twentieth century, Truckee Meadows residents talked sporadically about constructing a flood-control project along the Truckee River, but they were lulled by the lack of a truly damaging flood and—equally compelling—deterred by the considerable expense. All this changed in November 1950 when the worst flood in recorded history slammed through the Reno-Sparks region. Reno Mayor Francis “Tank” Smith quickly invited community leaders to a strategy session, and on November 29, a construction proposal was approved, mainly for the Truckee but also for the Carson River, which had experienced severe flooding as well. The meeting was led by George Devore, chairman of the Truckee-Carson Water Users committee, which had crafted the proposal in consultation with the United States Corps of Engineers, the agency that would oversee and perform the work. Devore, who was vice president of Sierra Pacific Power Company, blamed the severity of the flood mainly on encroachments in the river channel in Reno. Chief among these, he said, were two dams at Wingfield Park, the “notorious” river-clogging island between Virginia and Center streets, the low clearance of the bridges, and the retaining walls and fills that had narrowed the channel. The plan, some of which would come to fruition and some of which would not, was estimated to cost thirty million dollars, would be funded by the federal government, and would be repaid by those who benefited from it. On the Truckee, two mountain dams would be constructed at Prosser Creek and Stampede Valley in the California Sierra while the older Boca Dam (1939) would be closed; ownership of the new dams and reservoirs would shift to private interests after the federal government was repaid; Lake Tahoe’s maximum level would be reduced from 6229.1 feet to 6228 to prevent damage to shoreline property owners; the river channel would be deepened through Reno and the encroachments eliminated; levees would be built in the Glendale farming district; the reefs obstructing the river flow at Vista would be removed; and new power generating plants would be built for Sierra Pacific. In the end, Boca was not deconstructed, the dams did not leave federal control, and Tahoe’s maximum level remained the same. Of the projects that did come to fruition, the two new mountain dams did so somewhat indirectly through the Washoe Project. The idea for this latter project had been initiated in 1950 when the Bureau of Reclamation issued a feasibility study for upstream reservoirs on both the Truckee and Carson rivers. While these dams were intended mainly to benefit agriculture and hydropower, they would also provide flood control. 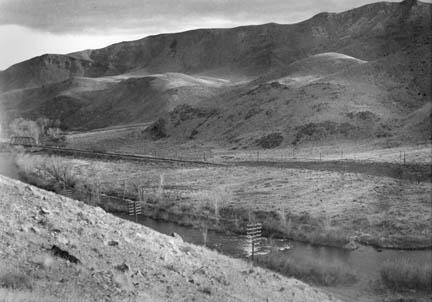 Congress authorized the work in 1956; and although the Carson projects were never built, Prosser Reservoir was completed in 1962 and Stampede in 1970. In 1954 the corps did approve several other elements of the proposal. Under the federal Flood Control Act of that year, the river would be “channelized” through a good deal of downtown Reno and also below Wadsworth on the Pyramid Lake Indian Reservation; in other words, the channel would be deepened and straightened, which at that time was considered state-of-the-art flood control. “River-clogging” Scott Island was to be eliminated along with some other small islands. In the eastern Meadows, the Vista reefs would be removed and much wetland drained, while various channel “improvements” would be constructed between Reno and Tahoe City, California, and also from Vista to Nixon in Nevada—the latter work intended to protect downstream interests from the increased flood flow that channelizing would create (when a river channel is narrowed, the water moves through it more swiftly, making the flow more dangerous in sensitive areas downstream). In any event, most of the corps’ work was finished in the early 1960s except for the projects at the McCarran and Parker ranches, which were done by 1968. The first indication that the corps’ work was not the best of all possible solutions came quickly in 1963. That year’s major flood scoured the riverbed below Wadsworth to what furious tribal members said were catastrophic proportions, especially for the fragile riparian zone. Water experts blamed the scouring for the inability of the river to adjust so soon to the upstream channelization of 1962, but that did not assuage the tribe. 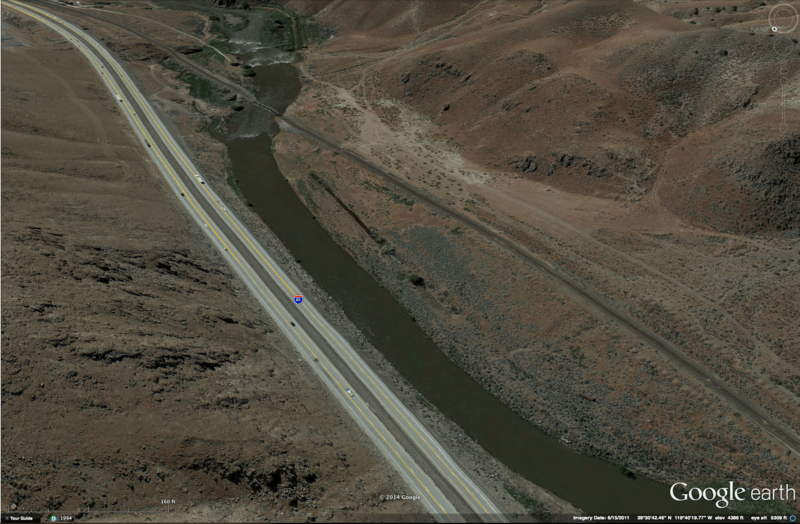 In addition, the channel adjustments had left Steamboat Creek, a major tributary, sitting well above the river, which forced the creek to begin eroding toward the Truckee, clouding the river for miles. And while the removal of Scott Island did indeed let flood waters rush through Reno with less restriction, the river became less scenic and natural. Especially noticeable was the disappearance of the beloved willows, cottonwoods, gooseberries, currants and wildflowers that had grown there and on other nearby isles and had been much praised in an 1874 news article in the Nevada State Journal. Despite this, the upstream community was generally pleased. The corps, encouraged by this positive reaction and wanting to do more, held a public meeting in 1964 to determine what additional flood control might be desired. Out of this gathering came a plan to build Verdi Reservoir, but the project did not sit well with the public because it carried an enormous price tag and would inundate much of the Verdi area, forcing the corps to move both U.S. Highway 40 and the railroad tracks. The public was also unenthused about other ambitious proposals including further Truckee Meadows channel work, a storage-interceptor project on Steamboat, and potential reservoirs at Gateway, the town of Truckee, Hirschdale, and Lawton. Still, in 1974 the Washoe County Commission asked the corps to take another look at flood projects, this time as an alternative to the 1964 proposal. But nothing came of that either. And so matters stood until the huge flood of 1997 inspired a more “river-friendly” effort whose rallying cry featured intense criticism of the Corps’ 1960s work—now considered an ill-advised and counter-productive, strait-jacket approach to waterways.